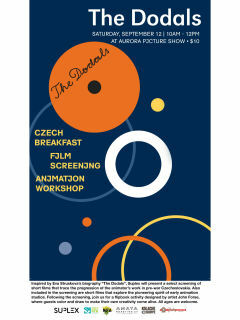 Suplex and Aurora Picture Show will present a fun-for-all-ages morning of animation shorts by Czech animation pioneers Karel Dodal, Hermina Dodalova and Irena Dodalova, complete with Czech breakfast bites and an assortment of light refreshments. Inspired by Eva Struskova’s biography The Dodals, Suplex will present a select screening of short films that trace the progression of the animator’s work in pre-war Czechoslovakia. Also included in the screening are short films that explore the pioneering spirit of early animation studios. Following the screening, there will be a flipbook activity designed by artist John Forse, where guests color and draw to make their own creativity come alive. Free for Aurora members and $10 for non-members.